Sometimes a girl just needs a fail-safe chic outfit. For me, this means my favourite black skinny jeans, a black roll neck, and statement accessories. 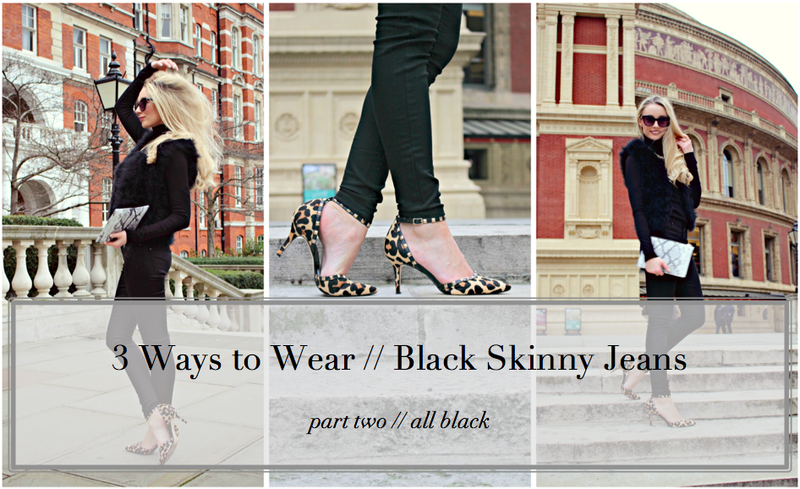 As part of my 3 Ways to Wear // Black Skinny Jeans, this all black look is my second way to wear the New Look jeans. In part one, I teamed the black denim jeans with my cosiest knitwear for a dressed down look, but here you can see it’s just as easy to dress them up! An all black look needs some varying textures to break it up, so I’ve added this Turkey feather gilet from Topshop which also helps to keep me snuggly warm! Peeking out underneath is a statement black and gold necklace with reflective embellishment which add yet another dimension. Gold always goes well with black, so any chunky necklace with gold in it will complement an all-black outfit. As well as textures, I’ve added some focal points to this look with a snake skin clutch bag, and leopard shoes. The leather, faux snakeskin clutch from Whistles is small enough to tuck under your arm, and is a chic way to carry your essentials. The Leopard print court shoes with stud detail are from Dune, and I wear them to add instant glamour to my all black look. So we’ve had dressed down, layered knits for my first look (here) wearing the New Look skinny jeans, and now an all black chic ensemble. Next Tuesday i’ll be posting my final look wearing the jeans to round off my 3 Ways to Wear mini series! How do you wear your skinnies?